Laser-particle acceleration is an emerging area of physics that is expected to further significant future advances in modern cancer radiotherapy. An international team of physicists, which also includes scientists from the Forschungszentrum Dresden-Rossendorf (FZD), has succeeded in accelerating protons to energies never before achieved with laser-particle acceleration. Radiation in this energy range is for example needed to treat eye cancer. Intense laser light interactions with matter are able to accelerate particles to high energies that otherwise can only be achieved using large accelerator facilities. Worldwide, physicists are researching the principle of laser particle acceleration and radiation, for future use in cancer treatment for example. Prof. Thomas Cowan, director of the Institute of Radiation Physics at the Forschungszentrum Dresden-Rossendorf (FZD), is one of the first scientists who conducted studies on laser acceleration of protons. The current world record measurements are the result of experiments by Sandrine Gaillard as part of her doctoral thesis, which is supervised by Prof. Cowan. These were obtained in partnership with scientists at the FZD, the Sandia National Laboratories, the University of Nevada, Reno, and the University of Missouri, Columbia, all at the Los Alamos National Laboratory in New Mexico, USA. Protons of energies in excess of ~ 67.5 mega-electron volt (MeV) were accelerated. 1 electron volt is the kinetic energy which is obtained by a particle when it is accelerated by a voltage of 1 volt. The new record in laser-particle acceleration is due to specially shaped targets (see Fig. 1). 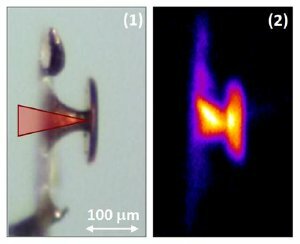 The scientists bombarded thin films with ultrashort laser pulses of ~ 600 femtoseconds (1 femtosecond = 1 billionth of a second) and ~ 80 joules, from which cone-shaped structures protrude, and whose tip is covered with a thin film flat-top. The surfaces were created using nanotechnology, and produced by the company Nanolabz. When the intense laser light impinges the inside of these anvil-like microstructures, electrons are liberated from the material. In contrast to smooth surfaces, the microstructures act as an electron trap. The electric field thus generated may be used to accelerate the protons to higher energies than ever before. Cu K-alpha X-ray imaging (see Fig. 2) was used as a diagnostic to help illustrate and clarify the laser-cone interaction. The scientists still have to resolve the precise interactions; however, computer simulations carried out by Thomas Kluge, PhD student at the FZD, already allow a good description of the new data, thus enabling deeper theoretical insights into the processes. Next, the researchers will measure the intensity of the proton beam - in addition to the energy this is essential for medical applications. The record measurements are presented at the 51st Annual Meeting of the Division of Plasma Physics of the American Physical Society, which takes place from November 2-6, 2009 in Atlanta/Georgia, USA.